We could see it was covered in scaffolding but typically we did not exploit scaffolding to get to places. At least, not then. Rooftopping was done purely using natural hand holds, and exploring was done with ready available openings. To actually trespass on scaffolding was a whole new direction. At least it was back then. The Shrewsbury Music Hall is actually a very interesting building, historically, being one of the last remaining medieval defensive halls in the UK. So I'm going to fill this blog with historical nuggets as well as photos. And on top of that, exploring a construction site was a very stupid thing to do! Click on a picture to see it big, and celebrate our continued existence as we navigated and escaped this death trap. A view of the square, and the courthouse (central) and Princess House on the right. In the distance is Halifax, gateway to the rooftop maze. A large portion of it is built on the 13th Century remains of the courtyard of William Vaughn's Mansion. In fact, I think the remains of the mansion were amalgamated into the newer construction. The passageway in from the front door is even situated above the actual pathway that led to the original mansion. It was made into the Music Hall in 1835. So it's quite ancient. 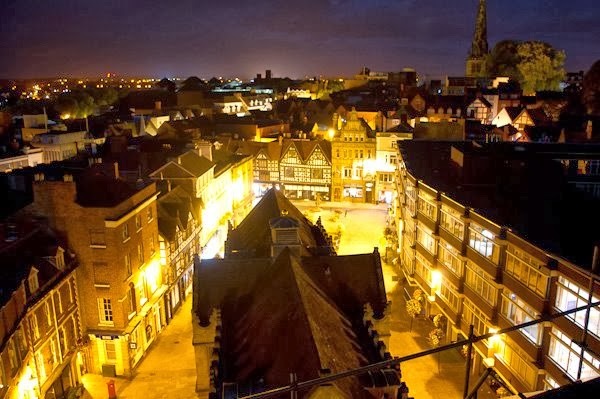 It is also situated next to a medieval alleyway, or "shut" as they are known. (Someone write in and tell me the difference between a shut and an alleyway). A view of the clocktower and St Chads Church, also deliciously half-covered in scaffolding. 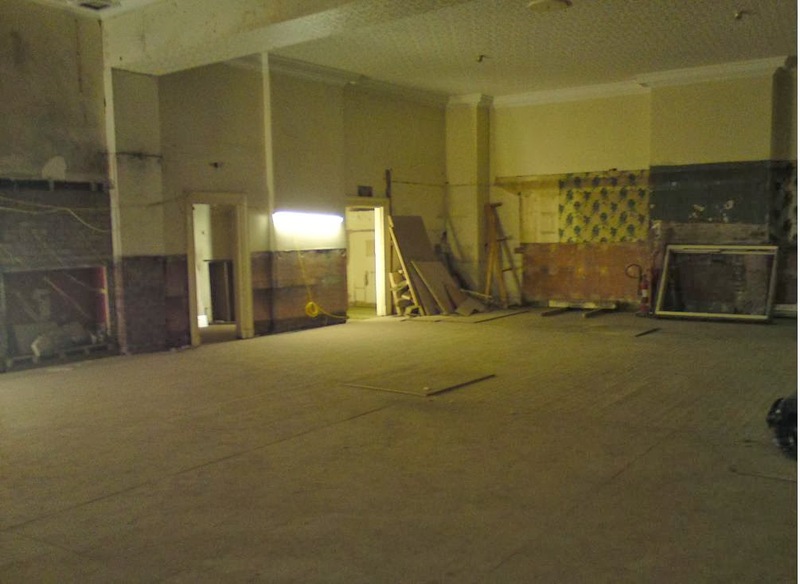 What is also known is that the old court house, that was also visible from the Princess House shots and central in the square, was allegedly connected underground to the music hall. The Music Hall houses some 18th Century jail cells and these were used to detain prisoners until they were led to the courtroom in the square. This was awesome- the roof of the Music Hall was covered in scaffolding all over, making it feel like it was indoors. Part of the fun of repeat visits was seeing how this developed. 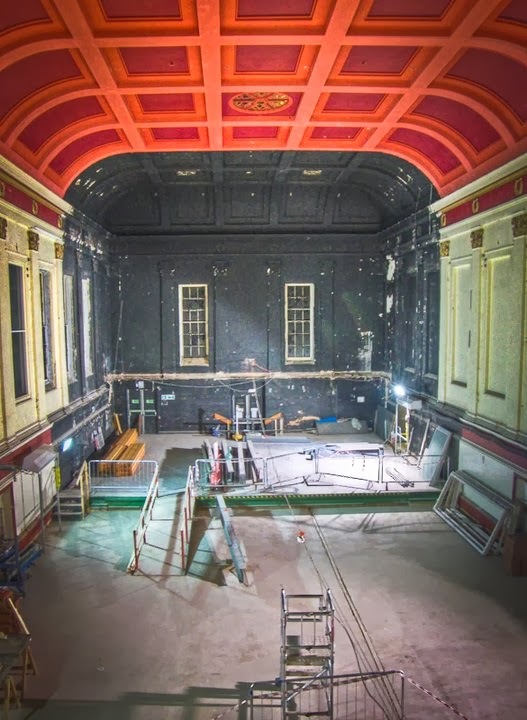 Part of the Music Halls transformation into a museum includes restoring old things, such as a roof from the 1600s that was destroyed in a fire in 1917, and a 13th Century archway. It also includes the removing of a 1960s boiler that's considered ugly, proving that Shropshire Council are selective about which aspects of history are worth preserving. Due to the fact that it is an amalgamated building made up of several over some 750 years means that restoration is very complex and they've come across a lot of structural problems, but the awesome thing about the Music Hall is so much of it was blocked off over the years that as they worked on restoring it, they found all kinds of fun new things too. 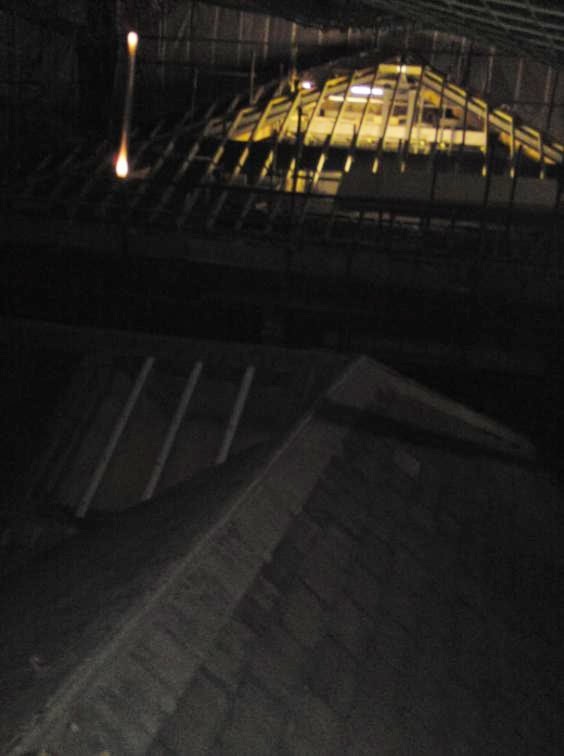 While we were able to get rooftop photos easily, towering over the Music Hall itself due to the raised scaffolding, getting in was another question. We found the upstairs windows easily openable from the outside and so we explored. We foolishly assumed it would be as easy as past abandoned buildings, but we were wrong. We got to the main hall, with its awesome red ceiling. 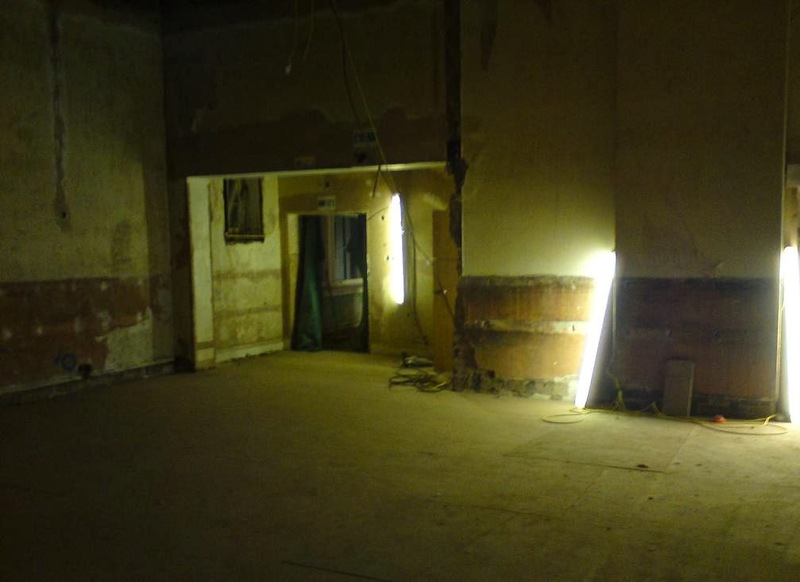 Back in the 1960s the Beatles allegedly played here and the room itself was one of Shrewsbury's most popular places to be from 1835 to 2008 (although the original rules said that children under 14, smokers, drunks, spitters, swearers and dirty folk would be removed from the premises). As we explored this amazing room, I accidentally set off an alarm. And I'll be honest, I froze in my tracks. The shock of the situation erased the instinct to run. I was with two other explorers- one of which I'd never seen move fast in my whole entire life, and I still didn't get the chance because he was long gone. I didn't even see him leave. My other friend grabbed me, which was nice as I had ventured in further than they had and it would be easy for him to just dive out of the window. My friend and I ended up lying flat on the scaffolding, too late to make it down in time before the security car pulled up. Amazingly, the security guy who poked around the building never found us. Perhaps he saw our other friend running away and thought he'd just check for damage rather than for extra people. If he did see our friend running, then he's seen something I've never seen. Good for him. 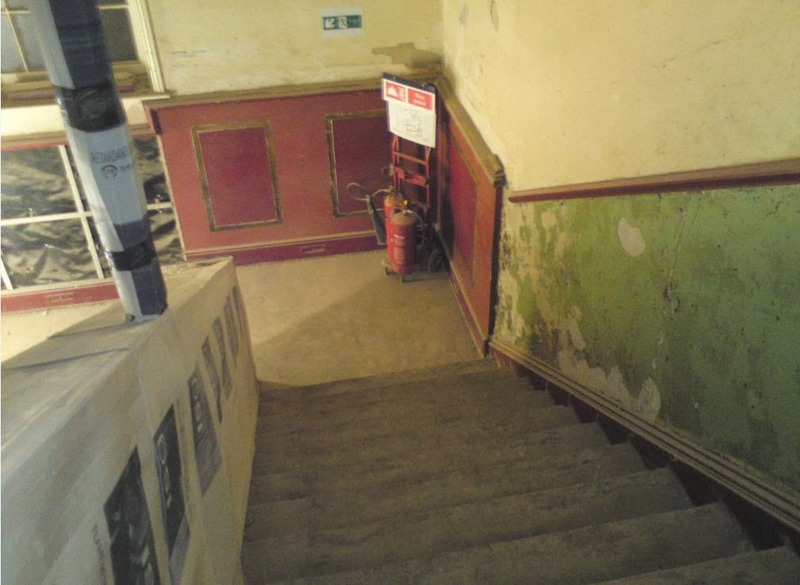 However, the Music Hall was revisited at a later date, when our local newspaper, the Shropshire Star, revealed that the restoration team had recovered the jail cells and also a cold war bunker beneath the building. But by this point my team had spread to the winds, pursuing their own destinies in other parts of the world. I was on my own. It's so weird to think that these rooms were once lived in and/or partied in by wealthy folks in the past, for surely there's the mansion aspect to consider as well as the bar where the folks would gather during intervals and pre-parties before shows. This was the place to be for all the rich folks. Back in the 1800s it would have looked amazing. On the return visit this room had changed significantly, but I knew better than to stroll on into it this time. One oddity was the small room with pictures of fish on the walls. Alas the stairway above led to the ground floor and that was alarmed. None of the higher floors, just the ground floor. How infuriating. So only the upper floors were explorable and the jail cells and bunker remained elusive.